There have always been fancy trucks and working trucks, almost for as long as there have been trucks at all. Today’s Nice Price or Crack Pipe Jeep is definitely a working truck, but will its price end up being something you might fancy? Last week the state of California enabled legal assisted suicide for the terminally ill. At the end of that same week we had a California-located 1994 Dodge Viper—a car known for its potentially deadly bite—with a price tag well under the model’s norm, opening the door for many who might not have considered one. Coincidence? I think not. Coincidence or not, that Viper’s low, low price did earn it an expected, and life-affirming 79% Nice Price win. Hopefully its new owner will enjoy it for a long, long time. 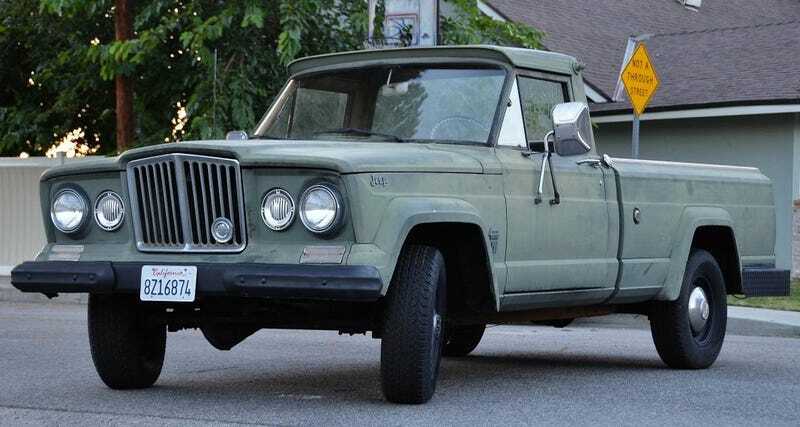 A long, long time is exactly how long today’s 1964 Jeep Gladiator has been around. That’s fully 52 years. When it was new, LBJ was president, the Vietnam war was ramping up, people were leaving it to the beaver, and McDonalds had only served ‘millions.’ It’s so long ago that up until April of that year the production Mustang didn’t even exist. Seeing as it was so long ago let’s talk for a minute about the Gladiator. These body-on-frame trucks debuted in late 1962, and shared a lot of parts with the Wagoneer station wagon. The trucks would be continued to be offered over the better part of the next three decades, during which time Jeep saw three different owners. The name they by which they originally went was Gladiator, and about that here’s a joke for you: what do you call a happy Roman? A gladiator! Get it? Glad-he-ate-her. Hello? Is this thing on? The trucks were further sub-categorized by wheelbase length, the 120-inch shorty being designated the J-200 while the 126-inch model went by J-300, etc. Further, the pickup versions could be identified by their bed style, where they were classified as king, queen, full… Townside or Thriftside. This 1964 Gladiator is a J-200 Townside which means it comes with the short wheelbase and the fenders-in-the-box bed. It also has 4-wheel drive made possible by a dual-range transfer case and Dualmatic front hubs. The Gladiator also had an IFS setup available but this one’s axle seems to be live and leafy. The ad notes that the engine ‘starts perfect.’ That engine is Kaiser’s 230-cid SOHC Tornado six, which upon its debuted was the only American-built production OHC engine in existence. Factory specs claimed 140-bhp and 210 lb-ft of torque for the mill. Behind that here is a three-speed manual, even if the ad says it’s an automatic. The carb has been rebuilt, which is a good thing if you’re young enough that such mechanizations are as foreign to you as a milking machine. The interior has been recovered in black vinyl, and there’s some incongruous black carpet on the floor. I’d prefer bare painted metal, or a rubber mat at the most, but if you appreciate the nod to civility here then there you go. Everything else in the cab maintains a warm patina of wear and age, but could stand some Chiquita Banana stickers or something. Outside things are equally well kept, with no major dings, dents, or body modifications visible, and a claim of no rust. The back bumper is one of those huge wrap-around affairs that in the black paint presented here looks like those huge sunglasses little old ladies have to wear right after their cataract surgeries. The truck used to be gold, but now it’s mostly a flat olive green, making it look like something Gomer Pyle would show up in for Sargent Carter-vexing shenanigans. One place where the wear and tear has obviously gotten out of hand on this truck is in the weatherstripping department, as the seals on the doors look coprolitic. You get a clean California title with the truck, however according to the ad it is currently under non-op status. That means it’s still in the system, but doesn’t have current tags and hence needs to have it’s current-year full registration paid. That would probably be about eighty bucks. Of course to spend that eighty, you’d first need to come up with the $4,900 asking price in order to get the seller to sign over the pink. What’s you take on that price for this working man’s truck? Does $4,900 seem a fair asking for this Jeep as it’s presented? Or, do you give this Gladiator a thumb down for it? H/T to Matthew for the hookup!